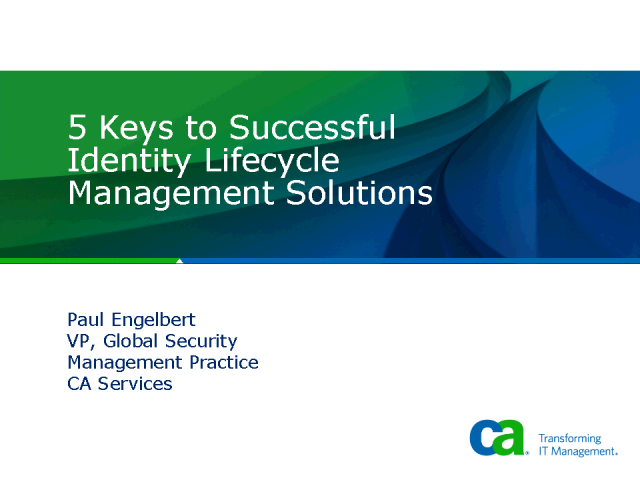 Identity Lifecycle Management is a comprehensive approach to managing user identities throughout their lifecycles. An effective identity lifecycle management approach should greatly assist corporations in improving efficiency, achieving tighter security controls, and ensuring continuous compliance. Implementing solutions in this area can be challenging if not planned effectively. This webcast addresses five fundamental steps that you can take to increase the success of your implementation. Our speaker, Paul Engelbert, VP Global Security Management Practice at CA, discusses best practices to follow—and common mistakes to avoid-- to implement an approach that achieves effective identity lifecycle management in a way that helps you simultaneously achieve scalable security management practices while delivering real business value in the first 60-90 days. The strategies outlined in this webcast are based on the experience gleaned from hundreds of wildly successful implementations.